Welcome back to Duckberg! Where the beloved triplets Huey, Louie, and Dewey that most of us grew up watching on TV are back and just as mischievous as ever. DuckTales #0 is written by Joe Caramanga and art done by Andrea Greppi. This comic book comes out to accompany the release of their new show on Disney XD in August. This book comes packed with two short stories that show off the boys 2017 makeover from the 90’s version. The book opens with a very proud Donald Duck who has started a business in doing tours of the famous little lake, which is actually quite big. 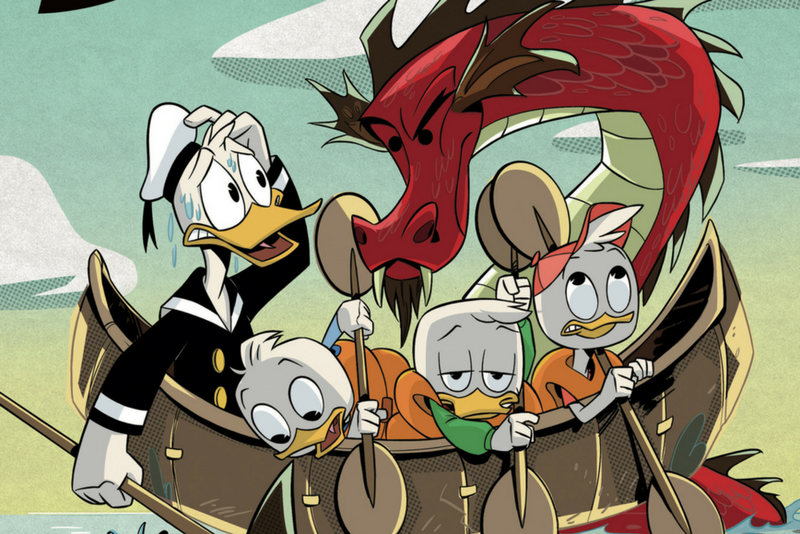 After one of his tours the boys decide to go canoeing but Donald won’t let them cause it’s simply too dangerous! Well the boys and Donald make a deal and the boys go canoeing Donald Duck style and the boys are not happy about that. While on another tour Donald gets into it with a know it all tourist that after some bickering the boat finds it self sinking leaving the boys, Donald, and the know it all tourist stranded on a little island. This is a light hearted comic book with hints of nostalgia for any reader that remembers the older 90’s DuckTales TV show. Pick this book up for a good enjoyable read and to immerse yourself in true Disney magic! Don’t forget to check out the new Disney XD show, DuckTales in August to follow along with more of Huey, Louie, and Dewey’s misadventures. This book was put together perfectly from the writing to the art work and especially capturing the true adventurous yet problem gravitating triplets.